We have a guest blogger today. My wife Carol, aka TrailBoss, has agreed to write a post for today. 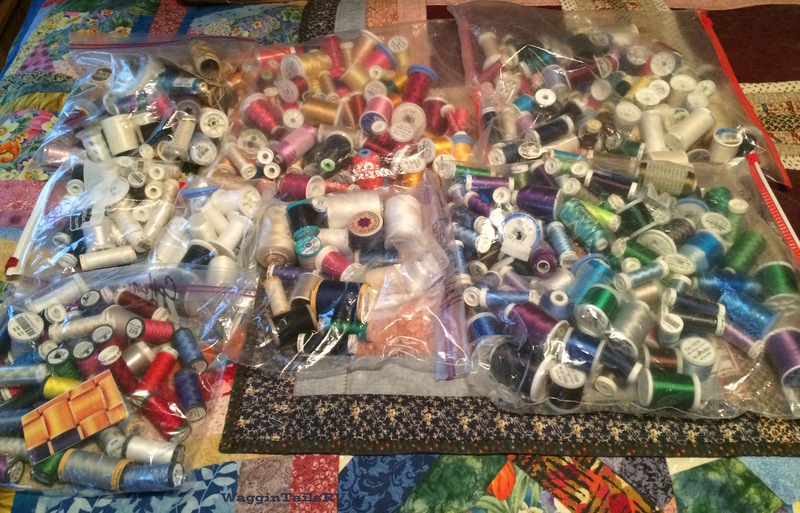 I have been thinking about what to start with and have come up with a topic that I am sure many of you full-time quilters and sewers can relate to–how do you store ALL of that Thread??? My Li’l Sis, Donna, is coming to visit the end of February and I have asked her to take a storage box of my stuff to her house to keep for awhile. Therefore, I need to do some major rearranging in my Corner before she gets here. If you read J’s blog about Carol’s Corner you have an idea what my mess looks like at this time. I have decided to start small. 😉 Below I have a picture of the amount of thread I have now. I have it all stored in a bottom drawer that I really need to use for something else. I currently keep it all in zip lock bags sort of by categories: embroidery threads (blues/greens/purples; reds/yellows/oranges; browns/beiges/tans; black & whites), hand threads, regular sewing threads, hand embroidery floss, pearl cottons. Well, you get the idea. What have you found to be the best way to store your threads, taking as little room as possible? I would greatly appreciate some feedback from all of y’all, especially those of you who are RVers or live in small spaces. I have declared to myself that the next days we have off I will begin the major rearranging. However, as I said above I am now starting small. I’m looking forward to hearing from y’all, thanks for stopping by. Special thanks goes out to the TrailBoss. She gave my fingers a break. If you are not a quilter or sewer, please feel free to share this post with your friends who are. You can copy/paste this link https://waggintailsrv.com/2015/01/30/guest-writer-today/ for sharing. This entry was posted in Carol's Corner and tagged quilting, sewing, storage, thread. Bookmark the permalink. It’s cute that you are blogging together! Keep on the good work and best wishes from Toronto, Jana. Hi Elle. I will post the answer when I decide what I am going to do. I am sure that I don’t have nearly as much thread as you do if you get it from others. I just saw a video of how to make a scarf of thread fabric and water soluble webbing. I may just use some of that thread to do that. I have A LOT of thread, especially since, as a fiber artist, I did thread drawing a lot. The best way to store it to keep it dust free, out of pets’ reach (since thread can be deadly), and to keep it contained. is to use the IRIS type containers like found in office supply stores. I think you have a couple of those. I have enough to keep them sorted by colors. I have taken some out to hang up on the wall, but regret that due to dust etc. It all depends on how much you want to store at your sister’s and how often you use your stash. I’m guessing a lot. I don’t know if you go on Pinterest any, but there are ideas on there. Hi Lynda. Thanks for your comment. I have considered using more plastic boxes but they take up more room. I do have 2 stack frames with boxes in them but they are full. I know that I can’t hand the thread frames on the walls because I don’t have much wall space and the frames would fall off the walls when we travel. I will go onto Pinterest to see what others have done. Surely someone had come up with some ideas that I can try. Storing thread isn’t a problem for me. I have a sewing shop. I take what I need, one spool at a time. When I run out I grab another spool off the shelf. My personal stash is housed in one small Rubbermaid container (about 10 x 12 x 4). I guess I would recommend buying stackable shallow containers for people with large stockpiles. Thanks for the suggestions. Amy, obviously has the largest thread stash of any of us. I used to work in Joann’s and had that opportunity to get thread or fabric anytime. It was fun, but I ended up having to give most of it away when we downsized to the RV. I have ordered the Artbin thread storage boxes from WalMart. I should have them on the 11th and can begin to sort through all that thread. I will take pics of the results. That’s a lot of thread! I once lived in a mobile home, actually two, an 8′ and a 10’x50′, so I can relate. One thing I have learned over the years–“stuff” grows at the same rate that the available space does. The more space, the more stuff. 🙂 Personally, I probably won’t ever get rid of my stuff. I go to auctions, and there are always ancient boxes with thread all tangled up with various sewing tools. Sorry, I’m not much help when it comes to collecting. We moved from 1800 square feet to 400 square feet. Carol has a small space but has mastered the art of maximize storage in a small space.